Late last spring our family entertained a house guest. 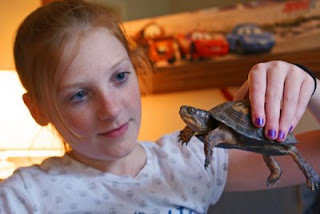 Shelly was an Eastern Box Turtle which I rescued on my way home from an art festival. She was slowly making her way across Highway 76 in the northern Georgia mountains and was about to meet the fate that many female box turtles encounter that time of year as they return to their own birth home to lay eggs. For the record Shelly was a temporary guest - in fact later that week me and my daughter Jessie made sure she was enjoying her new digs near the creek behind our home. It was interesting getting to know Shelly. My wife and I have always used opportunities like that to teach the kids about nature and the very cool critters that are our neighbors (including the giant black snake who has returned to live under our deck). Ironically it has been me to whom Shelly has had the most to say. Getting me to slow down is like telling Jeff Gordan to hop in the Dupont Hendrick Pepsi Frito-Lay Quaker State National Guard Tylenol Chevrolet and turn a few laps at Daytona behind a horse and buggy. It very likely isn't going to happen. Just ask Joan who has watched me for 16 years get distracted by shiny objects, funny sounds, sharp pointy things, stuff that catches on fire, and those odd neighborly critters. But living with a child like Ben one has absolutely no choice but to slow things down if only to grasp the always changing situation at hand. The memory of Shelly washed over me recently when I decided to embrace a new life of sobriety. That's another story reserved for our own blog but the primary advice from those that have success in AA? Take things one day at a time - try to concentrate on the moment in front of you. Otherwise life becomes too overwhelming and you'll end up defeated before the green flag waves. I should'nt think about the next time we are invited to a cocktail party because I have to retrain from having a drink while watching the Super Bowl tonight. We can't worry about Ben's next unexpected health issue because we need to concentrate on those things we do every day to keep him healthy. The point is that most of us are at our all-time worst when looking at the big picture too long. Fear, anxiety, anger, and resentment overwhelms us to the point that we become paralyzed. Shelly's pretty cool with that advice she left with us because when rescued her concern was just getting across that road in one piece. Then perhaps it would be time to figure out dinner plans. After that maybe she'd think about where to close up shell for the night. 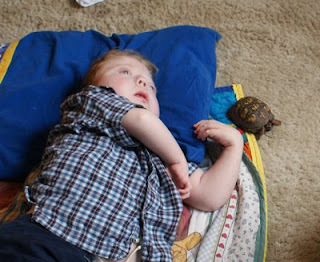 So after our reptile friend moved on, when I have needed some advice about slowing down, I've often looked toward my son for that encouragement. Even after a decade living with an exceptional child I always find it amazing how much I'm still learning from a kid who moves at a pace that only Shelly would appreciate. Most the time Ben & Bennie discuss reptiles, sharp pointy things, shiny objects, and NASCAR racing at their blog, A Work of Art: Raising Our Exceptional Son. Congratulations to you for taking that very big step. A family member has been a "friend of Bill W's" for nearly 25 yrs; it changed our family in ways we couldn't have imagined and made us stronger. Wishing you the very best. We could all take a page out of Shelly's play book, eh? Life moves so fast sometimes. I loved this story and the way you learned from Shelley, the way you've learned from your beautiful son. And thank you for reminding us, as well, to slow down. Thank you for this reminder: how much we all lose in the speed of today's world, and how much we gain if we just pause and breathe, one moment at a time. I needed this. Slowing down is good. Animals are wonderful teachers.